On March 14 we took a deep breath, had our mechanic bless our ancient BMW 530i, and headed south. Our destination was the Los Angeles County Fair venue (the “Fairplex”) in Pomona (out toward San Bernardino). The event was the next day, a southern California edition of the Family Winemakers tasting. As an added bonus the venue includes a Sheraton hotel that was walking distance from the pavilion. And what a tasting it was. We found half a dozen wineries making terrific pinot noir. But two really stood out: Picayune Cellars and Flying Goat Cellars. There were big surprises in Pomona! 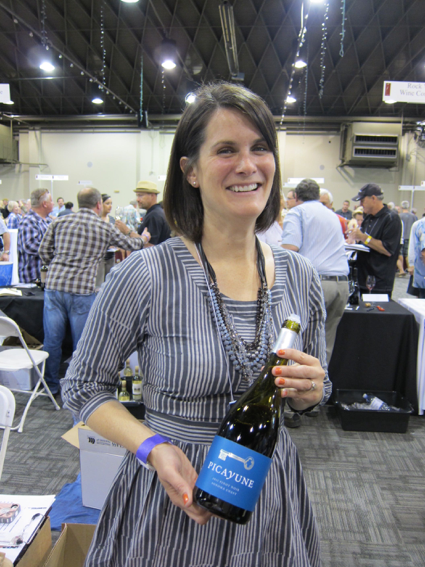 Picayune‘s 2013 Sonoma Coast ($29, MAJOR BARGAIN) is an excellent representation of this AVA. Aromas of cedar, wild strawberry and red raspberry followed by smoke, leather, and a hint of caramel on the palate. The finish is long and surprisingly aromatic. Jennifer Roberts, c0-owner of Picayune, was behind the table. We chatted for a while. 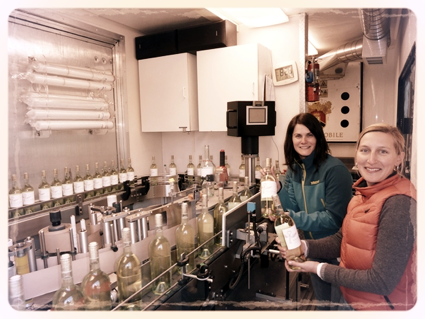 Their first bottling was a sauvignon blanc in 2011. Annual production is about 1,500 cases. Picayune, Flying Goat — who said the industry was running out of creative names? Flying Goat co-owner and winemaker Norm Yost was ably assisted behind the table by Danielle McKee. In an entertaining economics side-note, the other co-owner, Kate Griffith, lobbied Congress on behalf of the Mexican government to help get NAFTA passed. (On the home page, Ms. Griffith’s job description is “proprietor/chief philosopher.”) Norm and Kate are almost newlyweds, having gotten hitched January 1, 2010 (01/01/10 for numerologists). Flying Goat’s 2011 Dierberg Vineyard Santa Maria Valley ($46). Aromas of dark fruit with cherry notes are followed by ripe fruit with hints of smoke, leather, and earth on the palate. The 2011 Rancho Santa Rosa Vineyard Santa Rita Hills ($48). Opening with scents of dark fruit and black cherries lead to a great mouth feel with spice that lingers on the palate. A hint of vanilla at the end of the finish. And their 2010 Rio Vista Vineyard Clone 2A Santa Rita Hills ($42) is a fruit bomb that may put you in a diabetic coma. Scents of huckleberry lead to smooth tannins with hints of freshly-ground coffee. 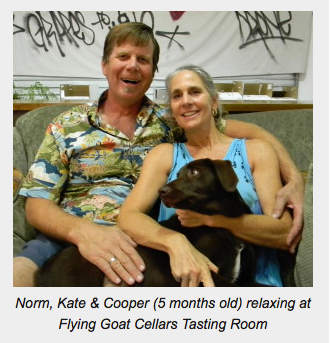 Flying Goat is located in the Lompoc Wine Ghetto. Somebody needs to put a decent hotel in Lompoc so we can visit the area easily. But Kate was once the Economic Development Manager and Planning Commissioner for the City of Lompoc, so perhaps she can do something about this. 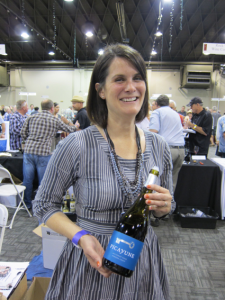 She is on the Lompoc Wine Alliance Board of Directors. And — best of all — she is treasurer of the Lompoc Valley Beekeepers Association. Norm is currently on the Board of Directors of the World of Pinot Noir after serving a stint as president. 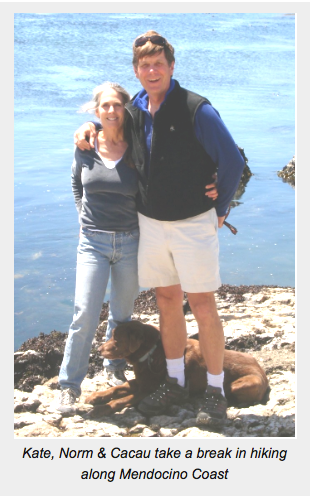 He is also a former board member of Santa Rita Hills Winegrowers Alliance and Santa Barbara County Vintners Association, and winemaking instructor at Allan Hancock College. In his 30+ years in the industry he has made wine starting in the Willamette Valley and working south until 2000 when he settled in the greater Santa Barbara area and started Flying Goat. We have a buying tip. Have you ever wondered what happens with the unopened bottles of wine after a tasting event? If you find something you like and whoever is pouring has the authority, offer to meet them after the event ends so you can take some of that wine off their hands. You’ll pay for it, but you’ll also generate quite a bit of goodwill. These folks don’t want to truck the wine all the way home. We continue to be amazed by the number of new pinot noirs, the ongoing increase in the number of wineries, and the incredible job growers and winemakers are doing with this most-difficult grape. After this event, we are in awe. Coming next: the half-dozen other pinot noir wineries worth looking for. Yes, that’s right: eight wineries producing pinot noir that we want to write about.